The latest Kickstarter project to catch our eye is one that aims to tackle the mess of cords that most of us have either lying under or around the workspace. Charger cables for phones, tablets, laptops and gaming devices can get pretty cluttered, but All-Dock is looking to change that. All-in-one chargers are nothing new, but All-Dock wants more than just a docking station for your stuff. “They envisioned as a functional piece of art” when they put this device together. A USB charging hub is hidden inside a nicely crafted wooden casing and underneath slats that your tablets and phones can sit in at an angle to use them effectively. The best part about this device though, is the speed in which it charges your gadgets. The USB hub that your charger plugs into produces a 2,400mAh charge for your device to refill off of. All-Dock says that is good enough to charge your smartphone from 0 to 80% in less than an hour. 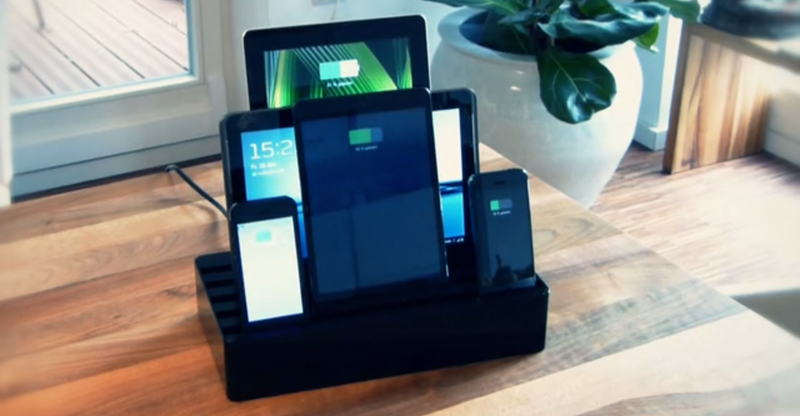 Each All-Dock can charge 6 devices at the same time so all your electronics can be usable. Backer prices start as low as $39, but those come without the high-powered USB hub. It’s not that much more to get yourself in on the fast charging game, so give it a look. In just a few days, All-Dock is already closing in on the 50% funding mark. Samsung Develops First 8Gb LPDDR4 Mobile RAM, Ready for 4GB RAM in Phones?